All pasta is served with 2 dipsticks. 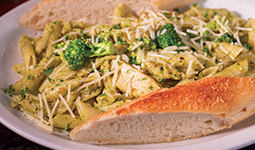 Grilled chicken breast strips & oven roasted broccoli with penne pasta tossed in a light basil pesto cream sauce; finished with parmesan cheese. 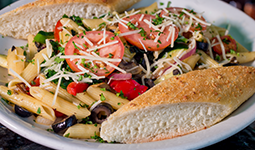 Sautéed fresh spinach, black olives, mushrooms, red onions & zucchini with penne pasta tossed in olive oil & garlic; finished with roma tomatoes & parmesan cheese. A bed of our Schpaghetti topped with tomato sauce, tangy meatballs & parmesan – or choose a spicy Italian sausage link instead. You know it, you love it. Tender mesquite beef strips & pan fried mushrooms with penne pasta; finished with a creamy alfredo sauce & parmesan. 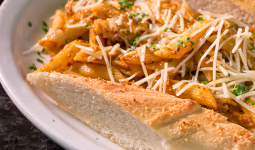 Grilled chicken breast or alligator sausage tossed in a spicy cajun chipotle cream sauce with penne pasta; finished with parmesan cheese. 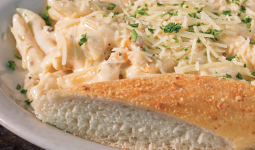 Grilled chicken breast with penne pasta tossed in a creamy alfredo sauce; finished with parmesan.